The Concept S pencil, Beach Walker Axcion was realized through the collaboration between the HIRAME hunter himself, Mr. Horita and the molding technology of DUO. The overwhelming castability, its natural action and the ability to capture the water in the productive range will assure you contact from the HIRAME which is getting harder and harder each year. With its 95mm and 30g “heavy weight body” and “straight layout” lip, we have minimized the air-resistance and stress on the lure from strong cross winds. It produces casting distance which rivals those of metal-jigs not only for experts but also beginners. 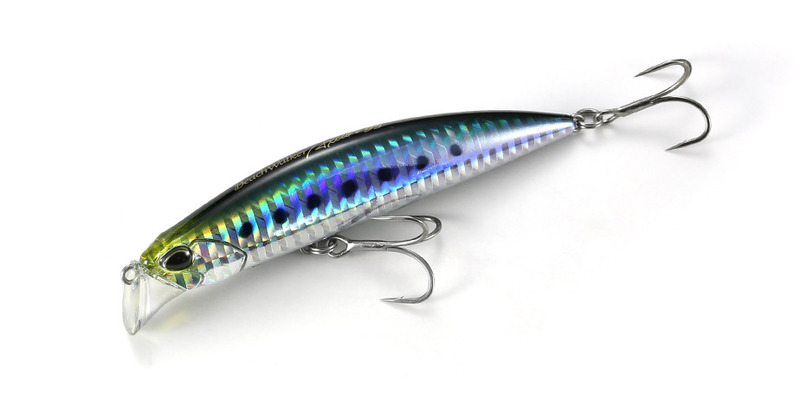 Though the lure is high in density, the flat body design has given it a collection of action patterns productive for the ever changing current conditions in the surf. It can be divided into 3 basic action patterns depending on the retrieval speed. The “tail-flip” action like a sinking pencil at slow retrieval, the “micro-pulsation action” at medium retrieval and the “flashing action” of a vibrant heavy minnow at high speed. The lure horizontally sinks with its tail section a little lower than the rest of the body, pulsating while doing so. Its diverse response caters for retrieval to jerking, inducing bites from the inactive HIRAME during the day game and from HIRAME that dislike over active lures. We have employed a “straight layout” where the lip blends into the face. This has given it the durability required in accidental contact with the rocks or the seabed, while sensitively transmitting information about the current to the angler, which is difficult to sense with a sinking pencil type lure. This unique lip design enables the lure to keep the tension on the line, maintaining the “feeding range”. Furthermore, this reduces unwanted line-slag with crosswinds allowing the angler to grasp the whereabouts of the lure, producing the extra 1 or 2 fish otherwise not landed.